IBM branded (non-generic) 300GB 10K SCSI HDD is hot-swappable for your IBM server storage needs. 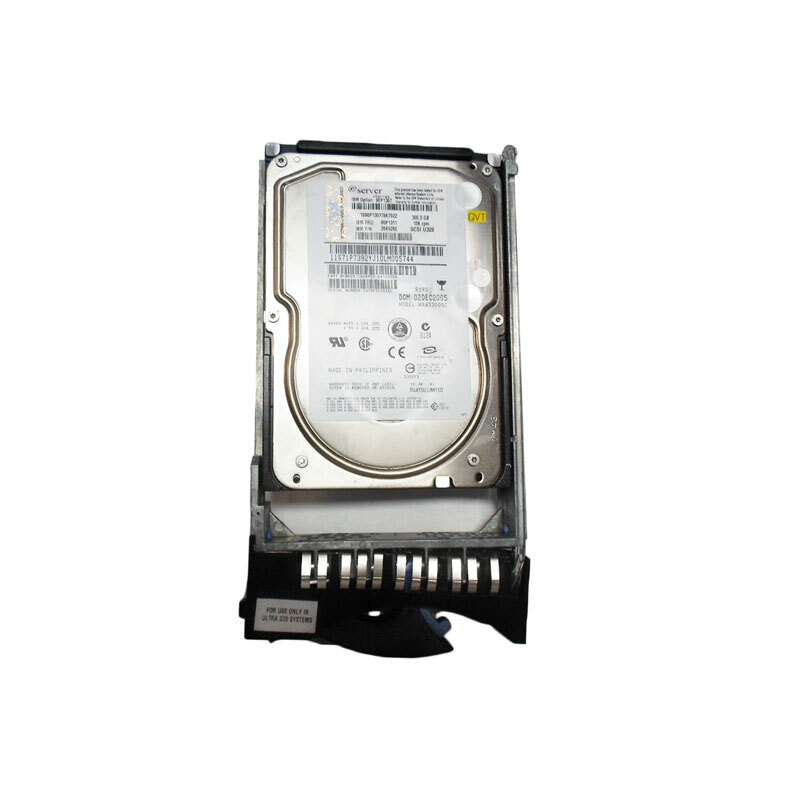 The IBM 26K5260 FRU 90P1311 is a 300GB 10k RPM SCSI hard drive for use specifically in IBM eServer xSeries Servers (IBM SystemX). Whether you’re upgrading your IBM server or simply looking for a replacement hard drive, we have what you need. If you don’t see the part listed that you’re looking for, please use our Contact Us form; as we have many parts in inventory that are not listed. Please note that all IBM Ultra320 hard drives, systems and parts are used / refurbished, fully-tested, and backed by a 60 day warranty. The IBM 26K5260 FRU 90P1311 provides faster interface speeds when attached to an Ultra-320-capable adapter. The drives are also compatible with earlier, slower SCSI adapters. The higher SCSI bus data rate along with the 10,000 rpm spinning speed of the disk platter can greatly improve a system’s overall data throughput. The disk drives’ 3.5-inch, 1-inch-high (25-mm) form factor allows them to be placed in dense system configurations; the perfect hard drive for IBM eServer xSeries Servers. Server xSeries including xModel(Type): x226(8648/8488), x236(8841), x326m(7969, 7992), x336(8837), x343(8847), x346(8840), x235(8671), x255(8685), x335(8676), and x345(8670). IBM Total Storage Arrays and Expansion models including: EXP400 (1733), EXP Plus 320, DS300 (1701), and DS400 (1700). BladeCenter HS20 (8843) SCSI Storage Expansion Units (26K4817, 39R8625). IBM Hot Pluggable Ultra 320 SCSI Hard Drives undergo an intense qualification process that eliminates data integrity problems firmware and O/S incompatibilities and other causes of data corruption or premature failure. IBM Ultra 320 Hard Drives are specifically designed and tested for flawless operation in your equipment. Configure your IBM server with a Genuine IBM Ultra 320 Hard Drive and you will prevent incompatibilities that can rob your system of performance or cause you to lose valuable data. Use the Genuine IBM Hard Drives that IBM recommends and enjoy our no fault lifetime warranty on this Hard Drive for as long as you own the server. Super Slim Line (SSL) drives are required in the IBM eServer xSeries Types supporting U320. SSL drives are 80-pin drives in a tray that is thinner/slimmer than the tray used in the 32P07xx part numbers of the same speed/capacity/interface. Using 32P07xx hard disk drives in the IBM eServer xSeries Types requiring SSL drives may cause damage to the drive or the enclosure, and are not supported. Please check your hardware to ensure you are purchasing the correct part numbers for your particular model.